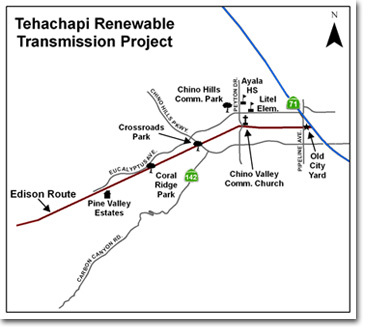 The map to the left depicts the SCE proposed route (Segment 8A) that would travel right through the heart of Chino Hills as part of the Tehachapi Renewable Transmission Project (TRTP). While all Californians recognize the need for renewable energy (and the corresponding infrastructure), there is concern over a section of the chosen route’s proximity to homes, schools, and parks. Community concerns are widespread and range from health and safety issues to aesthetics, noise, and property value impacts. A 3-mile portion of the TRTP would consist of double circuit 500 kV transmission lines that would be located within 500 feet of more than 1,000 homes, directly affecting approximately 3,500 people in Chino Hills. In some areas, new 198-foot towers would be located as close as 40 feet from residents’ backyards. Existing single circuit 220kV transmission lines on the 3-mile portion have been largely inactive for the past 30+ years. Transmission towers that now rise 98 feet and are currently no closer than 50 feet from property boundaries. Extensive research could only identify one place in the entire nation where double circuit 500 kV line was placed within a 150 foot right of way (ROW) in a residential area. This location is in Georgia and very close to one of the largest coal power plants in the nation where, in contrast to this segment of the TRTP, a very small number of residential subdivisions had grown within 150 foot of an existing double circuit 500 kV line. 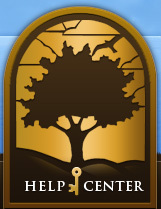 Who can I contact for TRTP project information? Do you know that you can look up the location of your address in relation to the TRTP project route?